The largest yacht in the world, the 180-metre superyacht Azzam built by Lürssen Yachts, was finally spotted on the move. Boat International spoke with Azzam's designer, Mario Pedol of Nauta Yachts, on the occasion of her maiden voyage. "To see her finally in voyage it is of course a proud moment but also a very emotional one: we, as all the others of the team involved in the design and construction, have been waiting this day for almost one year, since her delivery on October 22nd 2013," Mario Pedol told Boat International. "We all made a huge effort to comply with an incredibly short, thus very challenging, design and production schedule which Lurssen actually succeeded in achieving even one month head of time. Knowing now that the owner is finally starting to enjoy what we have created is definitely a happy moment." Minor refinements were completed in the time between her delivery and the maiden voyage, during which the above photo was snapped off of Gibraltar. Azzam has then trekked to Casablanca, Morocco, from Gibraltar, where she is still moored. She was clocked in cruising at 12 knots along the way. Notably, Azzam is capable of much swifter top speeds – exceeding 30 knots – as proven during her sea trials in the North Sea last September. As far as what it's like to have designed the largest yacht in the world, Pedol says, "After one year since her delivery we are kind of used to the feeling but, more than that, our satisfaction comes from the wide appreciation she had in the industry." Pedol is already using lessons learned during the design and build in Azzam to tackle new projects. " 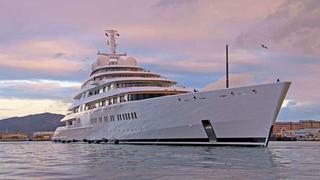 Azzam design and build process was like a PHD course in the megayacht world!" says Pedol. "We are now ready and confident in facing any kind of challenge in that field in a very mature way: the wake of Azzam, in terms of new projects, is already there and we are enjoying our confidence in dealing with it." Nauta Yachts revealed its design for a new 165m superyacht concept this year, a kid sister to Azzam, one day perhaps?